With Veterans Day just behind us, it’s an especially good time to think about the sacrifices veterans have made for us and how we can support them. One way businesses can support veterans is to hire them. The Work Opportunity tax credit (WOTC) can help businesses do just that, but it may not be available for hires made after this year. As released by the Ways and Means Committee of the U.S. House of Representatives on November 2, the Tax Cuts and Jobs Act would eliminate the WOTC for hires after December 31, 2017. So you may want to consider hiring qualifying veterans before year end. You can claim the WOTC for a portion of wages paid to a new hire from a qualifying target group. Among the target groups are eligible veterans who receive benefits under the Supplemental Nutrition Assistance Program (commonly known as “food stamps”), who have a service-related disability or who have been unemployed for at least four weeks. The maximum credit depends in part on which of these factors apply: Food stamp recipient or short-term unemployed (at least 4 weeks but less than 6 months): $2,400 Disabled: $4,800 Long-term unemployed (at least 6 months): $5,600 Disabled and long-term unemployed: $9,600 The amount of the credit also depends on the wages paid to the veteran and the number of hours the veteran worked during the first year of employment. 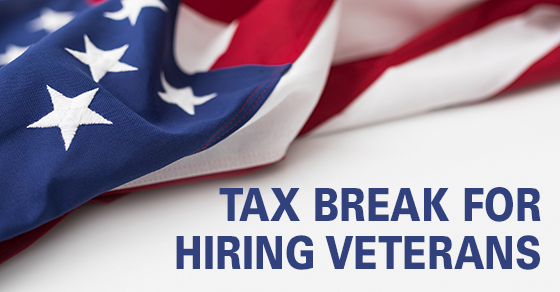 You aren’t subject to a limit on the number of eligible veterans you can hire. For example, if you hire 10 disabled long-term-unemployed veterans, the credit can be as much as $96,000. Before claiming the WOTC, you generally must obtain certification from a “designated local agency” (DLA) that the hired individual is indeed a target group member. You must submit IRS Form 8850, “Pre-Screening Notice and Certification Request for the Work Opportunity Credit,” to the DLA no later than the 28th day after the individual begins work for you. Also be aware that veterans aren’t the only target groups from which you can hire and claim the WOTC. But in many cases hiring a veteran will provided the biggest credit. Plus, research assembled by the Institute for Veterans and Military Families at Syracuse University suggests that the skills and traits of people with a successful military employment track record make for particularly good civilian employees.